Have I ever told you how much I love soup? Take a look at my Soup Menu and it will give you an idea! So when I find an outstanding new soup, you bet I’m going to share it with you. Here it is, my sister’s Ham & Potato Chowder. It’s a bowl of comfort, perfect for a winter day! 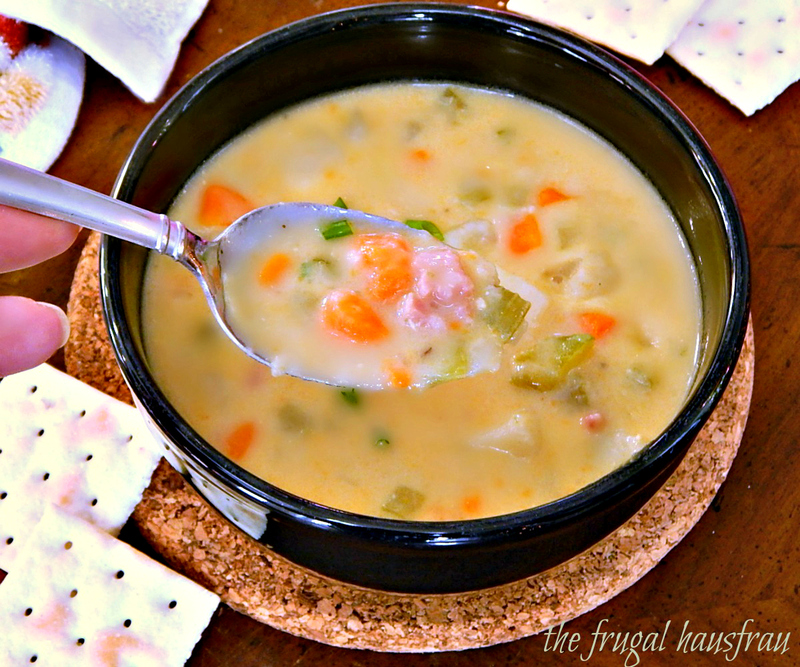 This Ham & Potato Chowder is hearty, comforting, simple and simply delish! Partially mashing the potatoes thickens it beautifully and the drizzle of cream at the end lends a gorgeous silkiness and richness. It’s positively addictive. It got two thumbs up from my Dad, who I happened to notice about halfway through lunch was using his fork! Now that’s a hearty soup – or maybe that’s just Dad, lol! Ham & Potato Chowder is down right cheap to make, especially if using leftover ham from a holiday dinner. If you don’t have ham leftover, you can totally rock this with a ham steak from the grocers, but it will likely be a bit more per pound. Now, if you do have a ham and make ham broth/stock, use it in place of the chicken stock. A few chives or green onion at the end add a little bite, and if you’d like, toss a bit of grated cheddar on the bowl, to melt in. Yum! And bacon? Well that can go on top, too. Ham & Potato Chowder makes a good sized pot, so you might have leftovers. The Chowder will tighten up a lot the next day; just loosen it back up with a little milk or stock. For other recipe using leftover Ham, see my 12 Days of Ham Post or follow the tags, below. Melt butter in pot over medium heat. Add carrot, celery, and onion. Cook until the vegetables have begun to soften and onions are translucent. Add garlic and cook for a minute longer. Sprinkle flour over the mixture and cook for three to four minutes, stirring often. Slowly add in broth, stirring. Bring to a simmer and add potatoes and ham, salt and pepper to taste and the dash of hot sauce or pinch of cayenne. Simmer gently for 15 – 20 minutes, until potatoes are soft and tender, stirring occasionally. Mash some of the potatoes until desired consistency. Add cream, but do not boil. Taste for seasoning and adjust for salt and pepper. Garnish as desired, with thinly sliced green onions or chives, perhaps a little grated cheddar cheese. As far as mashing, mash with a potato masher or hand blender right in the soup, or remove some and mash or blend in a blender. I like to use a ricer. Mash as much or as little as you’d like to get desired thickness. You know I’ll be bringing this to our Throwback Thursday #21 Link Party, hosted by Quinn of Dad What’s for Dinner, Meaghan of 4 Sons are Us, Alli of Tornadough, and Moi! That’s right – me! Click over to our Throwback Thursday post for rules and more info or just click on the blue leapfrog, below, to view all the posts or enter your own! As always, to view the link party or add a link, click on the little blue button below! I’m also taking this to Fiesta Friday 102, hosted by Angie of the Novice Gardener! Thanks Angie, for all you do! She’s backed up by two fantastic bloggers, Elaine @ foodbod and Julie @ Hostess at Heart. If you came to this recipe looking for a way to use ham, be sure to check out the link below for 12 Days of Ham. You might want to see the sister post for 12 Days of Turkey, too. This entry was posted in Click here for Bargain Meals, Click here for Fabulous Food Posts and tagged Bargain Meal of the Week, Carrots, Chicken Stock, Cream, Easy Recipe, Family Recipe, Frugal Hausfrau, Ham, leftover ham, leftover pork, planned leftovers, Potatoes, Soup. Bookmark the permalink. I look forward to trying this soup! Hi Beth, ltns! 🙂 I am SO glad you pointed this out – I’ve been a bit under the weather and prone to making silly mistakes! I usually use about 1 1/4 to 1 1/2 cups of ham in a soup like this, but you can go less or more, just what looks good to you.! I’ll correct it right away! Happy New Years! I am definitely in the mood for soup this month, and this hearty potato soup is something I have to try. I was thinking of making scalloped potatoes soon, but this looks better! I can only get away with so many soup dinners with my husband, but this one might be thick enough he won’t complain. I know I’ll love it! I know what you mean, some people just aren’t that in to soup. My son always says, in so many words, his problem with soup is it is just too sissy to eat! I love how thick and creamy this looks. The perfect comfort food! Thanks Julie! Now, if only we had some of your bread! Thanks so much Susan! I’ll be sure to tell my baby sis, too! 🙂 She IS a food goddess!~I’m not sure if her follow is a blanket endorsement, though, haha! I love her blog, and am really glad to have found yours! Thanks, Linda. It was just such simple down home goodness! Ham and potato is a great soup combo. It’s kind of funny, but I make a potato soup that I garnish with a bit of bacon, sour cream, cheese, etc. but I’ve NEVER made ham and potato! There will be future pots of this, though! Love soup especially soup that sticks to the ribs and fills you up. This is a meal and sounds so delicious. Thanks, Suzanne! It did fill us up! A good winter soup to be sure. I’m back down in SD, again, after a week home. How’re things up nord? Going down to -45 F please send warm weather. That’s good idea because after today, I am staying home until Sunday. I went out today for book club. I made a cake. And I am going out again today. Really brave. Can’t believe I am doing it either. It seems to be just as cold here in SD! Brave young soul you are! I have only just been outside the back door to let the beasties out. It was good to get out. By Wednesday it should be better. It’s only normal for January!